Here's the first thing you need to know about Victory View Vineyard - it's easily one of the best quality wine producers in the Upper Hudson Valley. The other thing you need to know is they work with cold, winter hardy, Minnesota grape varieties. They also may be one of the better wineries making wines with that kind of fruit today. And the last thing you need to know is - after drinking it - you'll want more. Victory View Vineyard is a family owned and operated, small farm in rural Washington County, New York. It is owned by Gerry and Mary Barnhart in Schaghtichoke, NY. They produce 'estate' bottled wine only! They grow all their own grapes sustainably on their farm. Our wines are made from French-American hybrid grapes and Minnesota varieties as well, which thrive on their sloping site with a southern exposure. Gerry is a dynamo. He is one of the moving forces behind the Upper Hudson Valley Wine Trail, where he was reelected President of the growing association in January of 2014. As I aid, Gerry and Mary are very serious about what they are doing. I finally got to meet Gerry at the Taste of Upstate New York just this past spring. He and I had corresponded over the years, but we had never met. They are a relatively new winery, and I was only able to try three wines. I understand they have a fourth now, and their list will continue to grow. According to Gerry and Mary, "the name for this wine came to us after long hours of picking rocks and numerous tiller repairs caused by hard work in our stony ground. We honor those who came before us and built the miles of stone walls on our farm, all by hand." For those of you unfamiliar with La Crosse, it is a modern hybrid cultivar of wine grape, mostly grown in North America. It produces grapes suitable for making fruity white wines similar to Riesling or as a base for blended wines. The grapes also make a good seeded table grape for eating. It has the benefits of early ripening and when hardened properly in the fall it is winter hardy to at least -25° F. As such it best suited to growing in more northern climates. La Crosse was produced and patented by famed Minnesota hybridizer Elmer Swenson around 1970. It is a hybrid of Seyval crossed to a cross of Minnesota 78 by Seibel 1000 (aka Rosette). This wine was made in stainless steel, and then aged in oak. It's has the feel of a light, oaked Italian white. A complex nose of green apple and tropical fruits. The mouthfeel is slightly lighter than oak, but it ha a creamy finish reminiscent of an oaked chardonnay. A very interesting, and very nice wine. First, a bit of history (I am an absolute sucker for dogs and history). According to Gerry and Mary, "We named our La Crescent wine Charlotte to honor the history of our area. After splitting from Albany County in 1772, our area was named Charlotte County in honor of King George III’s eldest daughter. The County was renamed Washington County in 1784 to honor the service of General George Washington during the American Revolutionary War. The name Charlotte calls to mind the Baroness Fredericka Charlotte Riedesel. The Baroness, and her three daughters, traveled with her husband, General Friedreich Riedesel, commander of the German troops in General John Burgoyne’s army of invasion that was defeated during the battles of Saratoga. The red-haired Baroness was described as being, "full in figure and possessing no small share of beauty." She was adored by the German troops and was credited for being "an angel of comfort" who "restored order to chaos" for her work caring for wounded soldiers and the women and children in Burgoyne’s defeated army." Charlotte is an off-dry, Germanic style wine from our 'estate' grown LaCrescent grapes. 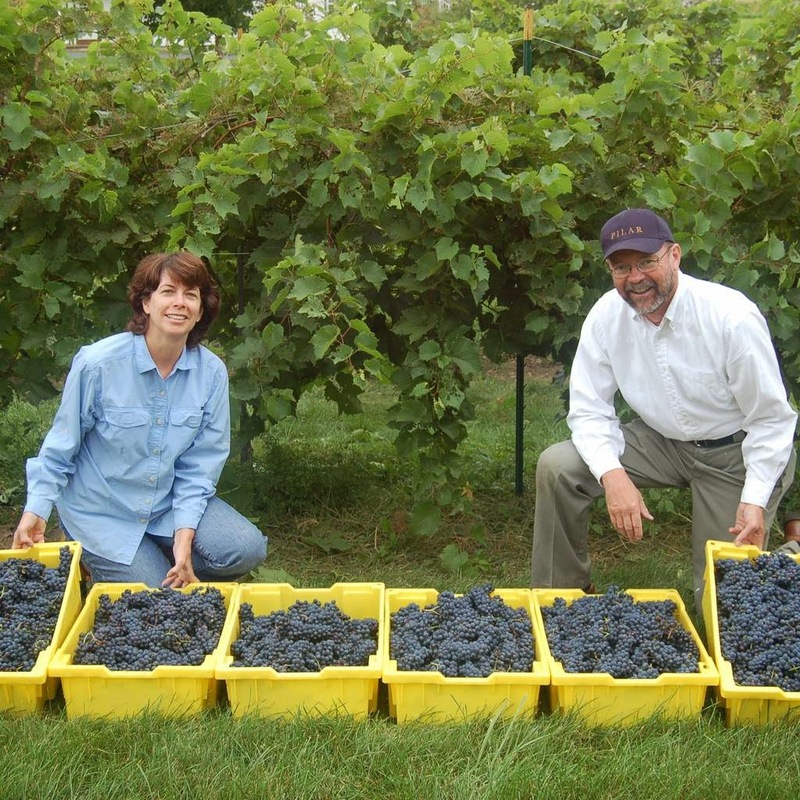 La Crescent, a Minnesota, cold-climate variety, combines St. Pepin and an Elmer Swenson (famous Minnesota grape hybridizer) selection from V. riparia x Muscat Hamburg. With this hardy heritage, trunks have survived a frigid -34°F when well cared for in good vineyard sites. It's moderately disease resistant and it can be very productive at harvest. LaCrescent is making more and more inroads in wine everyday. Victory View Charlotte 2012 has a big frontal attack of pink grapefruit, melon, and hints of dried apricot. Those flavors come across on the palate as well as a few other tropical fruits. Off-dry, with a nice bit of bouncy acidity makes this a bright, refreshing, mouthwatering white. A lovely wine!!! And easy favorite! Like many French-American hybrids, Marechal Foch has a bad rap. Mishandled for years by beginning eastern wineries, there were a great many that made awful, foxy varietals that scared away several generations of American wine consumers. But now, with the immense amount of knowledge out there, about vineyard practices, winemaking, and cellaring techniques, French-American hybrids, in the hands of a growing few, have made a real strong case for reconsideration. A real hint I that the wine was developed in Alsace the home of light bodied reds. Instead of trying to make inky wines with these grapes, I've always thought it better to make a lighter style wine that would carry all the fruit and by only limited wine/skin interaction carry fewer of the negative flavor profiles sometimes developed through extended fermentations. Thrown into this conversation my be Victory View Layfayette 2012. A stew of strawberries, cherries, and plums comes across the nose with hint of vanilla and spice. And as promised, their were light hints of leather and tobacco. Nice acidity kept the fruit vibrant in the mouth, and the medium tannins kept this medium-bodied dry red in balance. A lovely, drinkable red, made for the dinning room table. A lovely wine. Very impressive. Brought home several bottles of this! Again Gerry and Mary invoke a little history lesson here, writing, "Our Lafayette is named to pay respect to Gilbert du Motier, Marquis de Lafayette, the French general who became one of George Washington’s most trusted lieutenants and a hero of the American Revolution. While Lafayette was not present for the 1777 Battles of Saratoga, his efforts along with the Colonial Army’s success at Saratoga were pivotal in bringing France into the Revolution as allies of the fledgling United States." How can you not like these people?!!! I love their passion for history, their passion for estate fruit, and their passion for making quality wines. Victory View Vineyard is on of the shining stars of the Northern Hudson Valley and a credit to the Hudson Valley as a whole.